It is copyright © Claire Potter and Jacket magazine 2010. See our [»»] Copyright notice. So yes I pushed her flat into the dirt of this difficult country; and it is true that I write as I read — mistaking wreaths for wraiths, spires for spines, girls for orchids. Claire Potter was born in Perth and lives in London. She has two chapbooks of poetry, In Front of a Comma (Poet’s Union, Sydney, 2006) and N’ombre (Vagabond, Sydney, 2007). 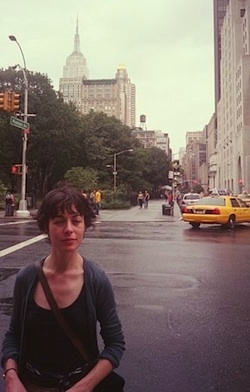 She was recipient of a 2006 Young Australian Poet’s Fellowship, and her first full-length collection, Swallow, will be published in October by Five Islands Press.